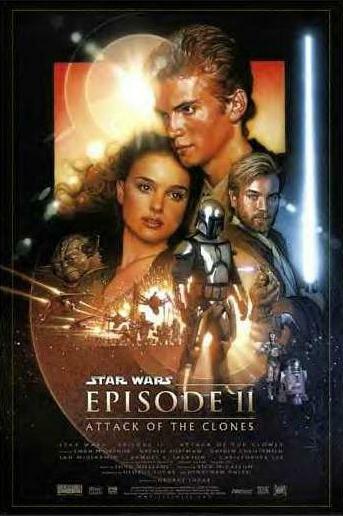 Statto's Movie Review Site - Star Wars: Episode II - Attack Of The Clones Review. Star Wars: Episode II - Attack Of The Clones (2002), Cert PG. Writers - George Lucas & Jonathan Hales. Starring - Ewan McGregor, Natalie Portman, Hayden Christensen, Samuel L. Jackson, Christopher Lee, Ian McDairmid & Frank Oz. Premise - It's ten years since the events that took place in 'The Phantom Menace'. Queen Amidala (Natalie Portman) is now Naboo's representative in the galactic senate and the target of a bounty hunter. Obi Wan Kenobi (Ewan McGregor) and Anakin Skywalker (Hayden Christensen) are assigned to protect her and find out who is trying to kill her. Meanwhile former Jedi Count Dooku (Christoper Lee) is banding together various planet systems to try and break away from the senate. Something Chancellor Palpatine (Ian McDairmid) will do anything to avoid, including starting a war. After the lacklustre 'The Phantom Menace', Attack Of The Clones is a real return to form for the Star Wars franchise. Gone are the attempts to pander to the kids in the audience (for the most part, more on this later) and the comedy characters. Jar-Jar Binks, the bane of so many peoples problems with the previous film is reduced to a mere bit player, but he does bear some major importance to the plot. Indeed, Clones has an altogether darker tone that is more akin to 'The Empire Strikes Back'. Another complaint levelled at the last film was the amount of time spent standing around and debating politics, 'Not enough action' was the cry. Well, Clones does have some political scenes, but these are in the middle part of the film and are kept brief enough for the audiences attention to stay focused. Cleverly these scenes are cut with those of Obi-Wan on his investigation and they provide a nice balance to the talky nature of the Senate scenes. The film opens with a bang, an attempted assassination and a high speed chase through the crowded traffic lanes above Coruscant. ILM have done it again. Just when I thought it couldn't get any better after Weta's work in 'The Fellowship Of The Ring' ILM go and pull one out of the bag. Taking a leaf out of Blade Runner's book, ILM has created a living breathing metropolis, Giant towers adorned with Neon signs, seedy bars and brooding industrial zones all make this city jump of the screen. Perhaps the biggest achievement for ILM in the film is the fact that you don't notice their work. Whilst filming, the vast majority of the sets were blue screens, they were then added later by ILM. It's testament to their hard work that apart from a couple of occasions you can't tell what's a set and what was created in the computer. The final battle scenes are immense, the sheer scope and audacity of the battle is amazing. Lucas has such an amazing vision and he has the team at his disposal to realise this vision. The world he has created is populated by such a wide and varied selection of creatures and animals that it takes on a life of it's own. From the city planet of Coruscant, to the dusty Tattoinne and Goenosis, to the lush and regal Naboo, to the rain soaked Kimono. All have separate environments and all are created with such attention to detail that they are believable as places that people (or things) live in, leading everyday lives. The film seems to ditch the ill advised midichlorian nonsense that was dreamed up for Episode I and harks back to the force that we know and love from the original trilogy. Yoda feels pain and suffering when something happens light years away and a scene with Jedi children (or younglings) is just delightful. The climatic lightsaber duel is breathtaking and easily matches the final duel from Menace. There are moments during the final duel where it I got the feeling I get when I watch the original films, it just 'feels' right. I touched on the comedy aspect of the film earlier. To go with the darker tone of the film Lucas has cut back on Jar-Jar and any other comedy characters. However that's not to say that the film is a laugh free zone. Ewan McGregor flexes his comedy muscles and has some excellent lines. His dry wit is a welcome bit of light relief. C-3P0 and R2-D2 fill the roles that they did on the original films (and didn't in Menace) as the hapless duo get into more tight spots. Some of the stuff from C-3P0 was quite unexpected and was a nice touch (although I heard some cries of derision from round about me). The film however really is about Anakin and his slow turn to the dark side of the force, before he eventually becomes Darth Vader. It's a part that really needed a good young actor in the role and Christensen delivers. About halfway through the film he has a really powerful scene, the first signs of the dark side in him and he nails it. It's a fine piece of work from a young man who is going to find the world as he knows it turned on it's head in the next few weeks. If I was to nitpick I would say that the relationship between Anakin and Amidala, whilst necessary in the long run, held the pacing of the film back. Christensen and Portman seem to have some good chemistry (rumours were rife on set that they were an item) and there scenes aren't horrible, but they were getting in the way of the more interesting plot of Obi Wan tracing the bounty hunter. One particular scene on Naboo reminded me of 'The Sound Of Music', not quite sure where George was going with that. Aside from that small point I loved Clones and it can be mentioned easily in the same breath as the original films, as it's better than both 'Return Of The Jedi' and 'A New Hope', it falls short of the almighty 'The Empire Strikes Back' though. Hell, maybe my judgement is clouded by my undying love of all things Star Wars (or maybe the dark side?) so feel free to knock a point of my score if your not a fan. At any rate for sheer spectacle and vision Clones is a must see, highly recommended. 10/10 for Star Wars Episode II - Attack Of The Clones. Poster Quote - The force is strong in this one. If you want to read the second part of this review click HERE. BEWARE! The second part contains major SPOILERS, only read if you haven't seen the film, or like having plot points and characters fates spoiled for you.